San Diego County’s northernmost harbor has managed its sea lion population, but can it be replicated elsewhere? SOUTHERN CALIFORNIA—There has been no shortage of stories in The Log covering the tenuous relationship between boaters and sea lions. The next installment in these series of stories falls upon Oceanside Harbor, where local officials created a space of sea lions to (mostly) reside without interfering with boaters, kayakers, paddleboard users and others. Paul Lawrence, Oceanside Harbor’s former manager, introduced dock space into waterway, essentially serving as an island a few feet off the riprap along North Harbor Drive. It’s a wooden dock structure with flotation, built by Oceanside Harbor Maintenance staff and measuring 30-feet-by-30-feet in size. The island is officially located 50 feet offshore, between the harbor’s fishing pier and transient docks. One could say the island loosely resembles the sea lion space at Pier 39 in San Francisco. Implementing a “Sea Lion Island” in the middle of Oceanside Harbor has yielded mostly positive results, according to Ted Schiafone, the harbor’s director. The sea lions don’t necessarily commit to staying in one designated place, of course, so the island isn’t a perfect solution – but it does appear to be a step in the right direction. Can similar measures be implemented at other harbors? Schiafone added no one officially associated with the city of Oceanside proactively directed sea lions to the offshore island. The jury is still out on whether the offshore island is an official success, but Schiafone does believe the 30-by-30 wooden dock is one of the better solutions offered to date. Sea Lion Island, according to Schiafone, has become quite the tourist attraction – which the harbor manager sees as a positive. There are, however, at least two concerns. The Log has reached out to two other harbors to gain perspective on whether they are taking measures to manage the relationship between local users and sea lions. Los Angeles County officials who oversee operations at Marina del Rey failed to reply to The Log’s repeated attempts to obtain any perspectives. The Log’s requests for what Dana Point Harbor officials are doing to manage the local sea lion population were eventually directed to a spokesperson with Dana Point Harbor Partners. The spokesperson stated Dana Point Harbor would manage the local sea lion population with tactics approved by the National Oceanic and Atmospheric Administration, or NOAA. 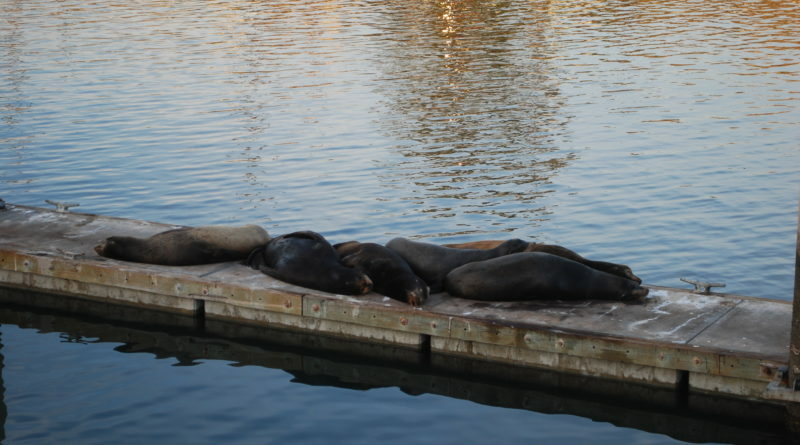 Does one size fit all or is management of sea lions at any given harbor contingent upon a variety of factors specific to the given waterway? The small sample size of this article certainly does not provide any finality, meaning this is an issue The Log will continue reporting upon and analyzing. I watch the sea lions frequently. The one thing I noticed is the dock made for them sits higher than the boat docks. I used to see them on their dock but have noticed the sea lions seem to prefer the boat docks. Could it be that the boat docks are easier to get up onto? If it were me, I too would use the boat docks. Maybe some type of device could be attached to their dock to make it easier for them, especially the pups, to get up on the dock. Or somehow lower their dock. Thank you.